LILONGWE-(MaraviPost)-The political and social commentators have warned United Transformation Movement President Saulos Klaus Chilima against giving Malawians more promises. “As a country lets avoid the culture of electioneering because we can give promises which we cannot fulfil as a leaders,” said Mvula. Although some of the country’s security scholars have been backing the decision by United Transformation Movement (UTM) leader Saulos Chilima suggesting to stop the culture of lining up police officers along the roads before the Head of State passes through, saying this is tantamount to excessive use of security, the commentators say the sentiments are mere rhetoric. Chilima, the country’s vice president, came out gun blazing on Sunday at a political rally in Ntcheu, promising to cut the presidential convoy on the first day of his job if elected President in May 21 2019 Tripartte Elections and stop the culture of lining up the police along the roads, saying this was slavery. Mvula says SKC is breathing fresh air and tackling issues that most politicians have hitherto regarded as routine. Mvula said he do not think that there is need for more universities but rather better investment and utilisation of the current universities. “As a country we must deal with infrastructure bottlenecks, lecture rooms, halls of residence for our students, cafeteria facilities, basaries for the needy, better conditions of services for lecturers, better libraries etc. On Quota system, Mvula says the issue of quota system is more complex than just saying I will abolish it. “I would advise SKC against advancing simple answers for more complex problems that this country is facing. Chilima also said once in power, the UTM will review the unnecessary closure of the roads when the presidential motorcade is passing, saying the current arrangement is more of glorification than security. 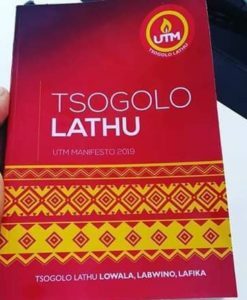 Meanwhile a legal expert Justin Dzonzi has faulted Chilima for suggesting that UTM will facilitate the amendment of the Constitution to give the office of the vice president more authority and certainty. Justin Dzonzi said doing so would be creating another parallel government within the government. Dzonzi said world over, the office of the vice president falls under the office of the president, saying this is because the vice president is just a care taker in the event that the office of the president falls vacant. “It would be wrong to give the office the permanent mandate, the vice president elsewhere gets instructions from the president. The framers of the Constitution knew what they were doing,” he said. Human rights and social commentator Undule Mwakasungula says Chilima should stop lying to Malawians. Undule says Chilima should speak facts than giving hope to Malawians. Economist and Social commentator Henry Kachaje has already questioned Chilima promises. Another social commentator and political analyst Lyson Sibale says Chilima was not ready to be a presidential candidate for 2019. He says some greedy guys pushed him and promised they will be there for him to source and provide funding and strategies. “But these people too were also not ready especially in terms of manifesto. They all did not have time to develop real substance. Chilima speaks well when he gets on the podium. I give him credit for the eloquence. But the guy is always telling us lies.” Says Sibale. Sibale says his campaign team is feeding him impractical and cheap promises which are mostly very childish. He says Chilima lack seriousness of a real manifesto with real practical and factually supported possibilities. “What Chilima says, anyone can wake up from slumber and just say them because they don’t really meaning anything at all. But I understand, these guys were not prepared. Anangonyamukiramo on second thought.” says Sibale.